When Snapchat was founded in 2011, no one saw it coming. By then, Facebook and Twitter had taken social media world by storm. They were the de facto social platforms on the internet. You were either too young to be on social media or too old to understand what social media was if you’d no account. Fast forward to today, the dark horse that is Snapchat is comfortably sitting in fifth place on the list of the most popular social media sites. With over four million active daily users in Australia, only bettered by Facebook, Instagram, WordPress.com, and YouTube, this occurrence is not a coincidence. Taking into account that WordPress.com isn’t even a “real” social media site, Snapchat now goes up to fourth place. 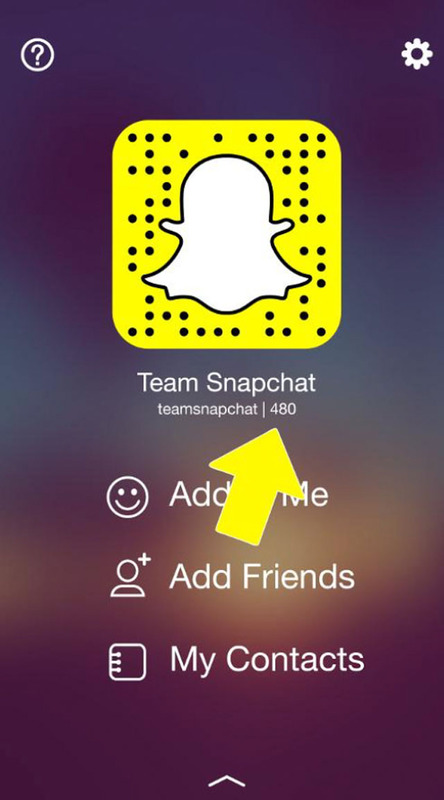 RELATED: Snapchat: The Stats That Will Make You Think Twice! Beyond that, Snapchat showed dust to Twitter, Tumblr, and LinkedIn over those two years. Evidently, Snapchat is no longer a pushover. Worldwide, Snapchat has also continued to defy the odds by rising to 11th place with over 300 million active daily users as reported by Statista in January 2017. It is no secret that savvy Australian marketers should give serious thought to Snapchat as a marketing channel. Taking the time to truly know what Snapchat is and how it works can increase your conversions in ways you never imagined possible. 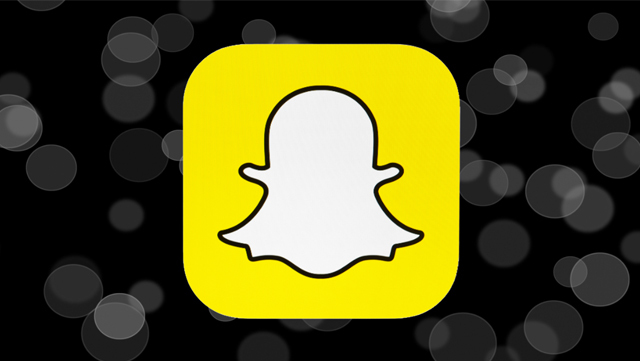 Determine whether Snapchat is ideal for your brand? Throughout the guide, we will use case studies of brands that are using Snapchat to boost their marketing efforts. Is Snapchat Ideal for My Brand? Want to find out? Just find out what Snapchat looks like. Snapchat is a simple yet powerful social media platform that allows users to share customisable, short-lived photo and video content with friends from their phones. It’s only usable on mobile via the Snapchat app and the shared stories self-destruct after 24 hours. The key take-away from this is that you’re most likely to be successful on Snapchat if you are an image-heavy brand. Retail and fashion/interior designers, for example, excel on the platform because these two industries rely on photos and videos to drive their marketing campaigns. In retail, you need to constantly share photos and videos of your products. When giving away discounts and season sale offers, you would also want to use rich media to showcase these offers. Fashion and interior designers also share a lot of images to win the hearts of consumers. But to get a clearer picture of whether the platform would be ideal for your type of business, you can go further to look at some of the most successful brands on Snapchat. Many of the earliest adopters of Snapchat were teens. This gave snack manufacturer Mondelez an incentive to hop onto the platform to promote its Sour Patch Kids candy products. On Snapchat, teens spend over four hours each day just sending and checking out other users’ posts. The idea was to get these teens to hang out on Modelez’s profile, interacting with and sharing video and images of Sour Patch Kids. In a video series called “Real life Sour Patch Kids”, for example the company teamed up with comedian Logan Paul to record pranks showing the teens that Sour Patch kids were really sweet although they may initially have tasted sour. Each week new stories were released showing “Real Sour Patch Kids” acting like teens. Big lesson, you need to post often (but not too much at the same time) to build a connection and engage with your fans. Here’s an image shared by Modelez’s during 2014 Halloween which drew a lot of attention. Who doesn’t know General Electric (GE)? The multinational conglomerate is one of the biggest manufacturers of electrical equipment in the world. But what would a company like General Electric be doing on Snapchat? You guessed it right – engaging their young fans. GE works with national science associations to help more youngsters take up science subjects. But more importantly, these youngsters are the consumers of tomorrow. Instilling the GE brand in their minds from a tender age is an excellent way to get them to like the brand. The funniest thing is that General Electric has made its Snapchat account so engaging you may not even recognise it. The way they explain those technical physics principles in their videos is a joy to watch. Moreover, they never leave their young fans behind if there is any news. They’ll quickly post a video with one of their staff explaining what the whole thing means. They use the platform to draw target young people’s attention. As we will see shortly, Snapchat is mostly made up of teens and tweens (those in their twenties). If you don’t have anything to show these age groups, you may be better offof investing your time and money on other platforms. When on platform, GE and Modelez become teens/tweens themselves! You may want to check out some of GEs snaps and you’ll notice that it really sets them apart. Instead of going on the platform to share any random stuff they come up with, they have completely taken to the teen/tween life and that’s why their fans love them so much. Can you measure up to the expectations? Are you prepared to become a teen to bond with the younger generation which make up nearly 70% of Snapchat users? If you aren’t, you may not find much success on the platform. Snapchat by Demographics: Who is Using Snapchat? Over 70% of the people using Snapchat are aged 25 and below. And nearly 23% of them have not graduated from high school, says Statistics Portal in their study. Other studies reveal that the largest age demographic on the platform is 18 to 24 taking up nearly 37% of Snapchat users. Those in the age bracket of 13 to 17 make up 26% of the users while 25 to 34 takes about 23%. Only 12% are aged 35 to 54 years. This means that less than 2% of Snapchat users are aged 55 and above. But it’s also interesting to notice that the higher age groups are slowly warming up to the platform. In the past three years, no one aged 25 and above was signing up for a Snapchat account. Today, over 50% of new sign ups are for users aged over 25. Back then, only about 5% of Snapchat users were aged 25 or more, today as we’ve seen, 26% of the platform’s users are aged 25 or more. Think about it – if you primarily sell to older people, people in their 40s, 50s, and above, then Snapchat may not be the best place to take your business. That said, there is a certain report that was released by Velocity somewhere in 2015 which shows that most young people who use Snapchat mostly do so because their parents didn’t use the social network. You would assume that this is because they don’t want to accidentally meet their parents on social media (who does?). So, as older people start warming up to the platform, you may want to keep an eye out on how these younger people will react. Will they ditch Snapchat? Anyway, for the time being, all we know is that nearly two thirds of Snapchat users are aged 24 and below. So, the platform would be most suitable for businesses whose target audience lies within that range. A surprising aspect of Snapchat is that most of its users are females under 25 years. Reliable gender demographics data are hard to come by as Snapchat doesn’t show gender info to users. Therefore, there haven’t been fresh data on gender but in late 2013 a Wall Street Journal report indicated that nearly 70% of Snapchat users are female. Knowing that Snapchat can be effective for your brand is great, but that’s just not enough to take your business to the next level. You must internalise the app to make it work for your brand. Download the Snapchat app from Apple iStore or Google Play Store. Once installed, you’ll be prompted to provide your name, date of birth, and an email address or phone number. Since companies don’t have birthdays, just fake a date – below 18 years. Then, create a user name. A user name is different from your real name and can be up to 15 characters long. Pick a unique name that instantly differentiates you from other users or brands. More importantly, pick the username prudently because you can’t change it after your account goes live. So, you need to note it down should you forget it somewhere along the way. Your name can however be changed at any time. That’s about it! Unlike other social networks, Snapchat doesn’t have an elaborate profile to fill; no bios, no website URLs. IMPORTANT! You must take a live picture for your profile since you’re not allowed to upload custom pictures. Once you’re through with the sign up part, all the action starts from the home screen shown below. Tap the yellow ghost at the left corner of the screen to access your personal snapcode and profile page. By default, your snapcode will be empty. It will be just the yellow ghost with nothing inside. If you want your image to appear inside it, you need to take a picture. If you don’t like the images, tap the camera button again to take another photo. 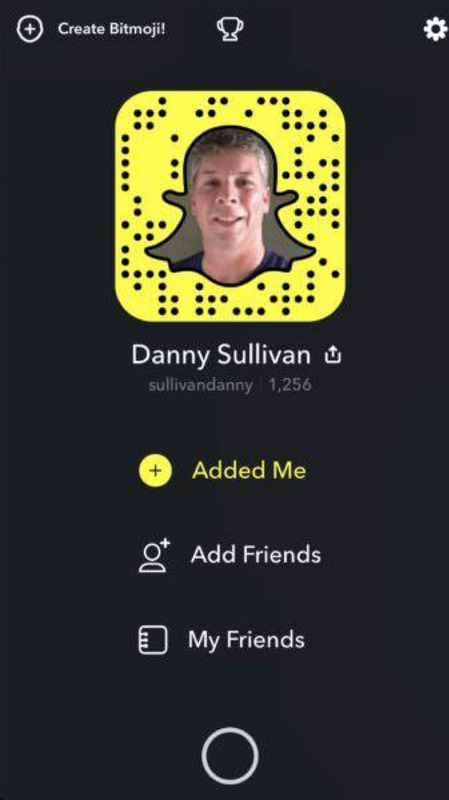 When you’re finally thrilled with the snapcode, click the back arrow (<) to save and go back to the profile screen. In some cases, Snapchat may use Bitmoji images rather than your snapcode. But you need to first create a Bitmoji. To do that, select the “Create Bitmoji” icon at the top left corner of your screen. If you used a name most of your fans know, you will be very easy to find on Snapchat. Snapchatters will start following you immediately. To see who has added you, go to your profile and tap on “Added Me.” You’ll see a list of the last 200 or so people who followed you. Now if there’s anyone you don’t want to follow back, just tap “Ignore” and they will be removed from your “Added Me” list. Or, you can block them permanently. At this point, you’re ready to start creating your snaps. From the home screen, tap on the circular camera button to take a picture. To take a video, tap on the button and hold until you’re finished recording. Because you don’t want to create a silent video, make sure to turn up the volume in your phone’s settings. When taking pictures, you can use the flash mode by tapping the flash icon at the top right corner of the home screen. If you don’t like the pictures you just took, tap the X icon at the top left corner to start over. Selfie lovers are also taken care of. Simply switch to the front camera using the switch icon found on the top left of the screen. Use the front-facing camera to take a selfie (retakes are encouraged). Again, you can tap the X icon to delete photos you don’t like and start over. Tap anywhere on the picture or video you just took. A text box will appear in which you can type a short caption. After adding the text, tap “Enter”, then use your finger to drag the caption around to position it wherever you wish on the image. You may also wish to change the size, font, and colour of your text. Simply locate the capital “T” icon at the top of the screen and tap on it once to make the text large and left-aligned and twice to centre-align everything. When the texts are enlarged, use the colour palette on the side to alter the colours of whatever you wrote. Then use two fingers to pinch the text smaller or further enlarge it, or even rotate it as you wish. Again, it doesn’t take magic to draw on your images. Just click the pen icon at the far top right corner. Drawing can be used to add a lot of effects to your image. 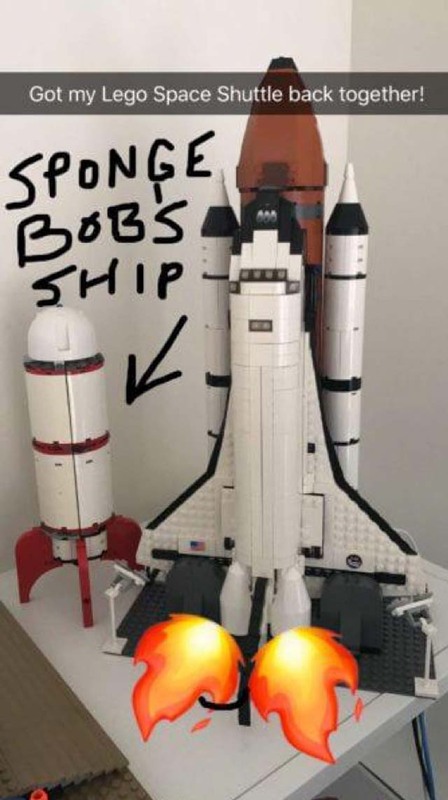 You can do it in addition to adding text or instead of adding text to the image. You can even use the colour palette to add more effects. Each time you lift your finger, you can start drawing something new in addition to what you had already drawn. Easy-peasy. – tap on the sticker icon at the top right of the screen and a variety of stickers will appear. Select one and use two fingers to enlarge or shrink it, and rotate. Add as many stickers as you wish. But you can also create your own stickers by cutting something off your image with the scissors. Click on the scissors, cut out some part of the image, and play around with it just like you’d do with the pre-made stickers. Below is an example of a snap that was made using text, drawings, and stickers. Looks cool, huh? After taking a picture, swipe right on it to see what range of filters are available. Typically, there will be colours, speed filters (for video), elevation, and time among others. You’ll also see geo-filters which show the name of the city or town you are in. For companies, sponsored filters may also appear (more on that later). Lenses are useful when you want to do that face-swap thing. Maybe you want to turn yourself into a dog or just do some goofy stuff with your face. Unfortunately, these lenses only work for selfies. Once you’ve taken the picture, tap on the image until the face is detected. Various icons will appear that you can apply. There are also World Lenses that work even for pictures taken with the rear camera. By default, snaps self-destruct within three seconds. But you have the choice to adjust this to between 1 and 10 seconds. After all the selfie-taking and effect-adding, it’s now time to share your snaps for everyone to see. 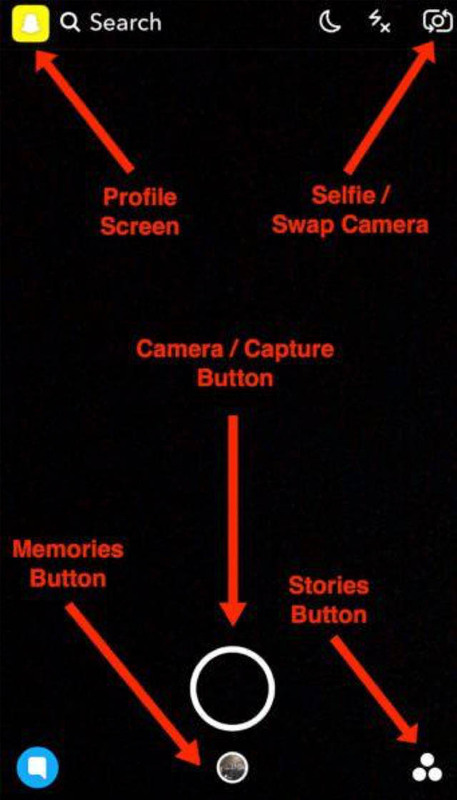 There are two options for sharing snaps; both of them involve tapping the arrow button at the bottom right corner of the screen. 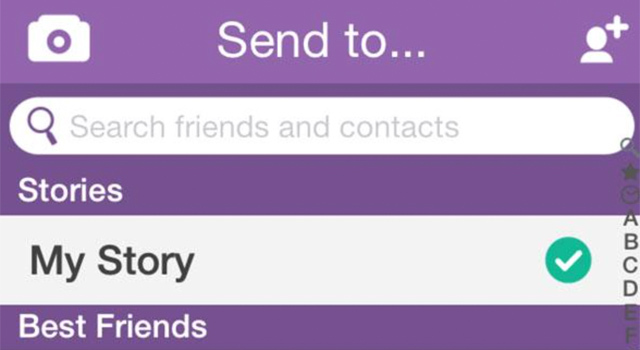 When you tap the button, you can choose to either share the story through “My Story” or send it to your contacts. Brands are better off sharing via My Story. 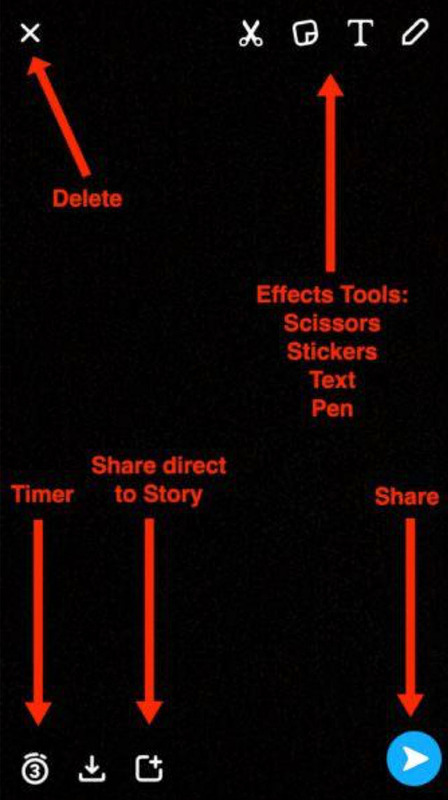 So, What Exactly are “Stories” on Snapchat? Stories are a collection of snaps taken over a period of time that tell your followers what you’ve been up to during that period. To view your story, go to home screen and swipe right. Or, tap on the three circles icon. Your story will be listed at the top as “My Story” though there will also be other stories from some of the users in your circle. Of course, this is just the tip of the iceberg, let’s now get to the meaty stuff. 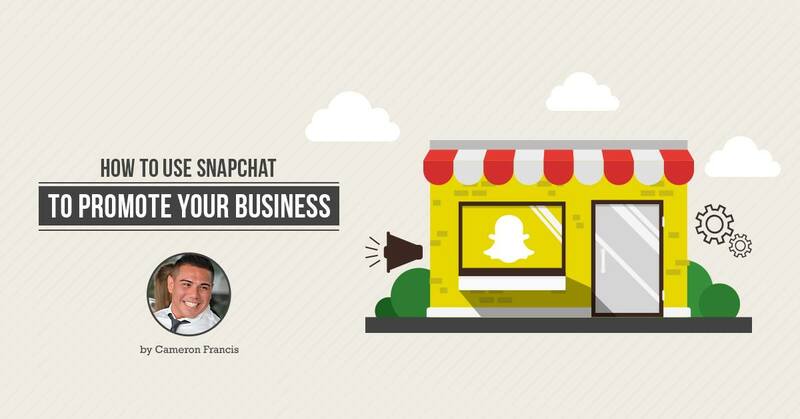 How to Use Snapchat to Grow Your Business? Now that you’ve learned how to use Snapchat, it’s time to use the knowledge to boost your business. There are multiple ways businesses can use Snapchat; ranging from giving fans a sneak peek into behind the scenes events to using it to advertise special offers. It’s all up to you. It’s likely that not all your fans and customers may be able to make it to each of your trade shows, exhibitions, and other events. You can use Snapchat to help them follow the event from wherever they are. Leading up to the event, build hype by showing fans how you’re preparing for the occasion. Show snaps of your staff rehearsing for presentations. Show them the cool signage you’ll be using. Share group photos of your staff members. These snaps will get everyone in the mood for the occasion, even those who didn’t plan to attend. During the event, share every bit of action as it happens. When chatting with executive speakers, or when one of your staff is presenting, record a video of that and share. Share as many snaps as you can. After the event, you can also share snaps of what went on, some of the highlights of the occasion, funny moments, and so on. Studies show that word-of-mouth marketing not only increases customer retention but can also double your sales. On social media, influencer marketing is one of the best forms of word-of-mouth marketing. By utilising influencers who already have a large fan base of their own, you can reach new audiences in a way traditional media can’t. Moreover, influencers are often respected members of society and will therefore add personality to your brand and Snapchat platform. Start by finding influencers that already love your brand. Sometimes the influencers themselves may reach out to you. Other times you may have to do your own research to find the right ones. Bottom line is that you can’t just pick anyone. You need someone who can connect with your brand. Once you’ve identified the right influencer, find out what kinds of snaps would attract the most attention and create the most buzz. A good example here is McDonald’s. 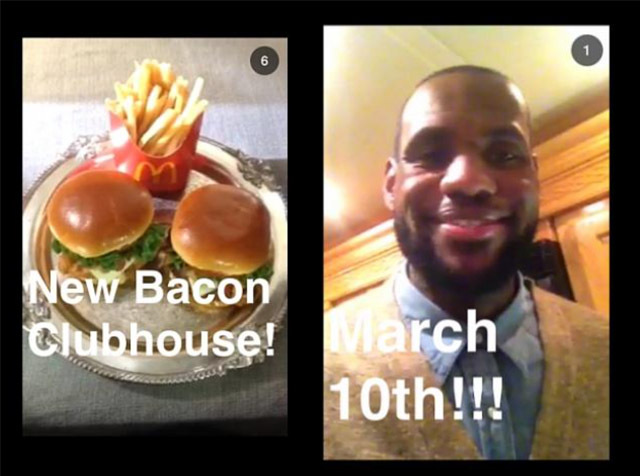 In 2015, the company teamed up with basketball star LeBron James to roll out a bacon clubhouse sandwich. It was magnificent. Although McDonald’s never revealed the true impact of the campaign, everyone knows that it got them over 3 million new fans! It has been found that sharing behind-the-scenes events can be a great way of increasing customer interest in your brand. Your fans want to know what you do differently that makes you a better choice. The My Story feature on Snapchat is an excellent place to share such stories. Google has done the same with enormous success. In developing countries such as India, the search giant has a project where it offers to take employees from other companies to see Google offices as incentives. But before this, Google created some nice ergonomic offices and shared every bit of the building process of these offices. They wanted to pique interest in the employees they would be taking to see the real offices. And that’s exactly what happened. You can share videos of a new product you’ll be releasing, show fans what your offices and workspace look like, introduce fans to your staff members, and even share event setup and photo shoot videos. This applies to even service providers who may not usually have pictures and videos to share on social media. If you’re a clothes retailer, you can share snaps of customers trying out your latest inventory. If you’re a restaurant, you can share videos of customers enjoying one of your delicacies, and if you sell drinks, you can share images of customers tasting your wines. The possibilities are endless. You can even make this interactive by asking your fans to directly participate. For example, posting a photo of a customer enjoying one of your burgers. If you make 3 or 4 different types of burgers, ask your fans to identify which burger is on the photo. Amazon once did this brilliantly. 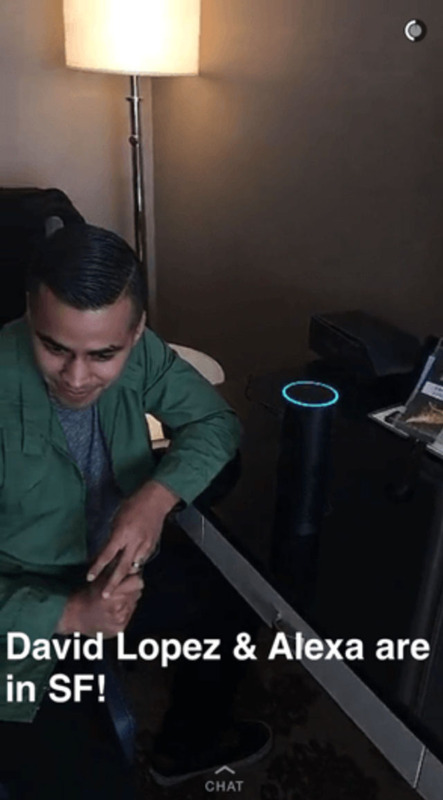 When the company first launched Alexa – the company’s female-voiced Echo Speaker, users were a little confused. Many didn’t really understand who Alexa was. So, Amazon used Snapchat to give clarity to the product. Within just four hours, Amazon gained 6,100 mentions and Alexa was finally known to Amazon users! Giveaways have always been an effective marketing tactic. If you have a large follower base on Snapchat, consider giving out free stuff. It could be discounts, or promo codes that users can redeem later or you can host a contest where the winner gets a prize. Another creative way of using the platform is by leveraging Snapchat’s ephemeral nature. Why not give out promo codes that expire when the snap self destructs? Many small businesses have done this with great success. You give out a coupon in the form of a snap and set the snap to disappear in say 10 seconds. So, the user has to redeem it within 10 seconds. For instance, in a clothes store, when someone makes a purchase worth over $20, you can give them a 50% discount on the next item they purchase worth the same amount or higher. But the catch is that they have to redeem the voucher within a certain period. An increasingly popular way of strengthening the bond between your brand and your fans is to feature them in your marketing messages. Instead of just focusing on influencers and celebrities, bring your fans on board by recording videos with them, taking pictures together, and sharing these on your Snapchat profile. While it’s a new idea, it works so well because today’s consumers are heavily influenced by their peers. They will listen to the experts and all the big names, but they are most alert when one of their own is in the limelight. To this end, you should also consider sharing other users’ stories. Ask fans to share their stories and then highlight the most inspiring story. You can even give prizes to fans with the most engaging stories. On Snapchat, unlike other social platforms, users get points for engaging. The more active you are on the platform, sharing snaps and chatting with other users, the more points you’ll earn. Marketers can take advantage of this feature by running contests where fans with the most points over a certain period of time win a prize. Normally, snapchatters get points for every bit of activity on their profiles and stories. If someone likes your snap, you get additional points, if someone comments, you get points, and if someone shares the snap, you also get points. The idea, therefore, should be to encourage your fans to seek as many likes, comments, and shares as possible. As they increase their engagement stats, your brand will benefit by gaining increased visibility. Before you know it, your small campaign has reached hundreds of thousands of users. The more people know about your products and services, the higher your conversion rates will be. After putting in all that effort, taking videos, editing, sharing, the last step is to review your performance and see whether you’re getting any returns on your investment. Unique views on Snapchat refer to the total number of people engaging with your content. How many people opened your images or videos and viewed for at least one second? To avoid complications, even if the one person checks out a video five times during different sessions, it is only listed as one unique view. This is especially important for brands that use the platform to give away coupon codes which followers are required to snapshot and show to store managers when claiming their prizes. Interestingly, this is a unique metric which is not available on other platforms but proves useful for Snapchat marketers. You’ll get not only the number of screenshots taken over a set period of time but also the most snapshot content (videos, pictures, photos with text, etc.) and a record of who took the snapshots. In marketing, a much needed metric is bounce rates which essentially tells marketers how many leads didn’t convert. Leads that didn’t convert are those who began the journey but, for some reason, never got around to making a purchase. 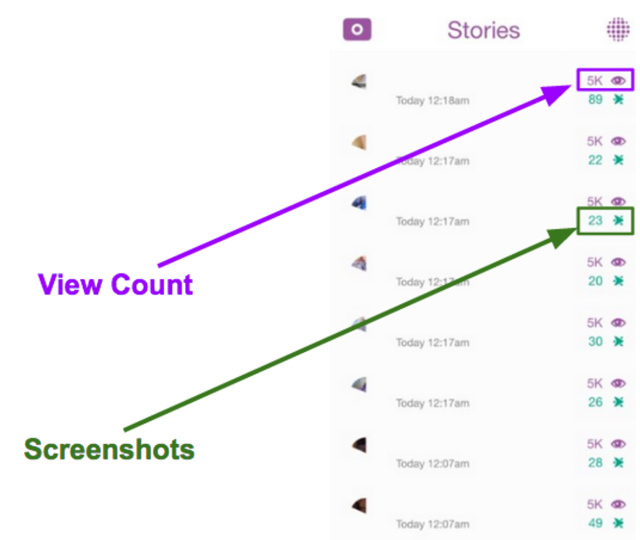 Snapchat has a similar metric that tells marketers how many viewers didn’t watch their story to the end. This allows you to identify which of your stories your audience liked and which ones they didn’t. Fall off rate is tied to completion rate and tells marketers at what point followers stopped watching your story. The simplest way to calculate this parameter is to determine the difference in view rates between one snap and the next. Divide this difference by the number of views of the first snap, and then divide the result by 100. Once you know at which points followers abandon your stories, you can then re-strategise and find ways to improve those parts. What period of the day are your followers most active? To gain the most exposure on Snapchat, you need to identify when they are most active and try to mostly engage them during those times. Finding this out will require dedication and patience. Run several snaps at different times of day and days of week for a few months to see what times have the highest engagement. On-demand geo-filters are one of the coolest features on Snapchat allowing brands and businesses to target a particular location where a competitor conducts business or is hosting an event. Currently, you can filter images by time, location, and event. Once the geofilter goes live, you can follow its performance directly on Snapchat! One way to use geo-filters is to reach your competitors’ audience. For instance, if Google is hosting a conference, Microsoft can set up a Snapchat geofilter to reach all users engaging with the event on Snapchat. And if your next door competitor is hosting an event, you can target Snapchat users engaging with their snaps. Snapchat keeps daily records of some of the key metrics like total views, screenshots, on-demand geo filter stats, and other engagement data. 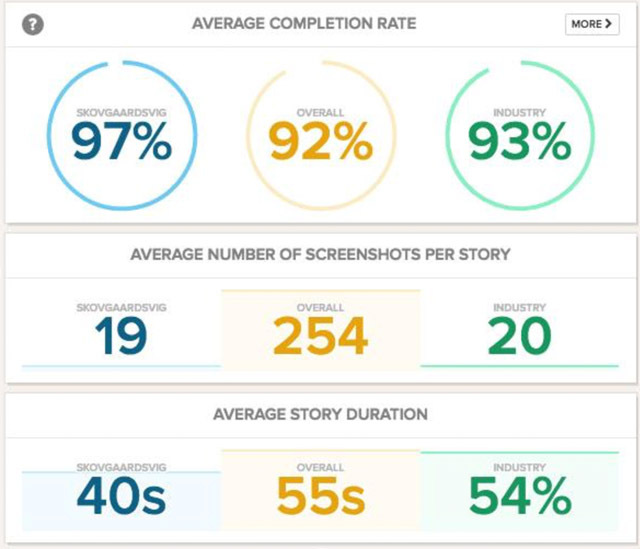 Launched in 2015 Snaplytics is a dedicated Snapchat analytics tool that offers insight into key metrics including; open rates, views, average number of snapshots per story, completion rate, and so forth. Here is a screenshot of Snaplytics showing some of the stats you can follow using the tool. 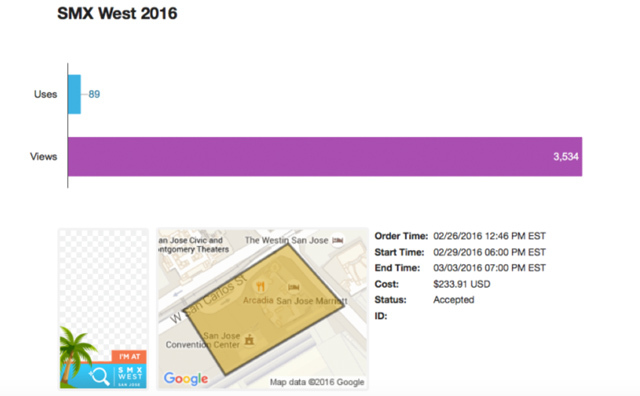 Another special analytics tool for Snapchat marketers is Delmondo. One of the key advantages of this tool is that unlike most Snapchat reporting tools that only provide 24-hour data, Delmondo provides both daily and long-term reports. You can pull up basic data like completion rates, screenshot rates, and impressions as well as more advanced data like channel comparisons and audience insights. That’s everything you need to know to successfully market on Snapchat. As always, keep in mind that social media is all about engagement – socializing. Initiate conversations, share your stories, and promote as many items as you want, but never forget that the fans also need space to make their contributions. It’s a give and take relationship. Lastly, Snapchat isn’t like any other social media platform. Snapchat is fun and full of thrill. It’s upbeat and alive. And it’s this endless fun that appeals to its young fans. Don’t try to revise the rules by taking your dull, technical product descriptions to the platform. You will fail. If you want to be successful on Snapchat, be fun just like everyone else on there!